It’s about time that I post another anime article on this site. My dear readers might know that historical fiction stands as one of my favorite genres. Hence, Alexandre Dumas is my favorite author, and Rurouni Kenshin stands as my favorite anime. 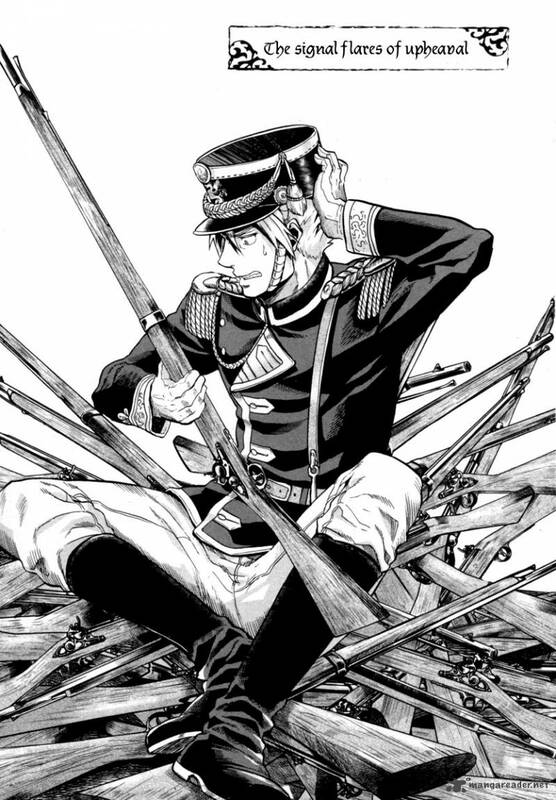 So, I found myself delighted to discover such a detail-oriented, beautifully drawn, and character driven manga as Gunka no Baltzar. The last quality is always a huge plus for me, and I hope that someone turns Michitsune Nakajima’s riveting manga into an anime in the near future. The story is set in a fictional 19th century Europe where the countries are renamed, but parallels are easy to draw. For example, I am certain that Weißen (it’s so much fun to use the German double s) is Prussia, Baselland Bavaria, and the Ezreich Republic the Austro-Hungarian Empire. Weißen is competing with the Ezreich Republic for an alliance with Baselland, which introduces much intrigue into the plot. The countrie’s two princes represent the factions, with the King being influenced by a criminal mastermind and Ezreichian diplomat and the titular character, Bernd Baltzar, holding the ear of the second prince. The king wishes to keep the status quo, while the second prince, even though he loves the traditions of Baselland, wishes to modernize. Both want to ensure that Baselland remains autonomous. All these factors create a thrilling atmosphere of realpolitik, which is actually similar to the Bakumatsu period of Japanese history (1853-1867). 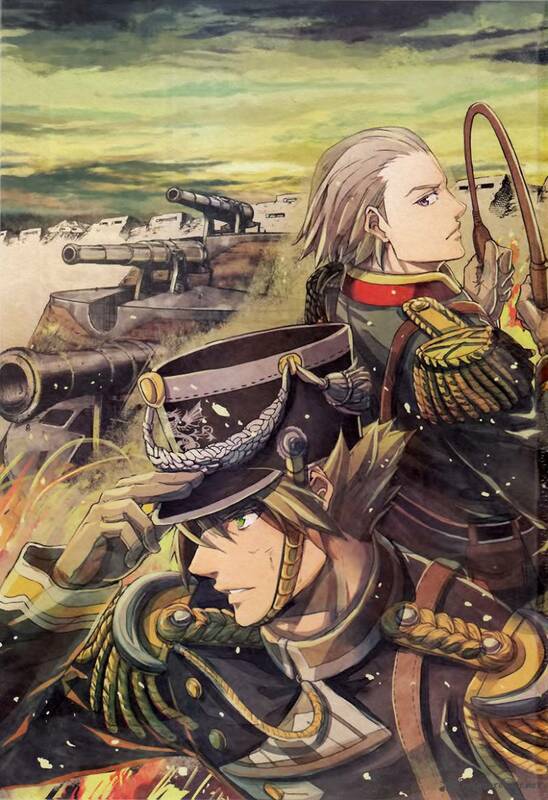 Baltzar is initially sent Baselland in order to become an adviser for their military academy as a friendly gesture by Weißen. Initially, he tries to befriend certain students, introduce modern theories of warfare, and eliminate certain barbaric practices at the military academy, such as whipping students for poor performance. Attempting to reform this last practice brings him into conflict with the second prince, whom he did not know was an instructor at the academy. But, Baltzar’s courage and resourcefulness lead to Baltzar becoming the prince’s right hand man and makes him a player in Baselland’s politics. 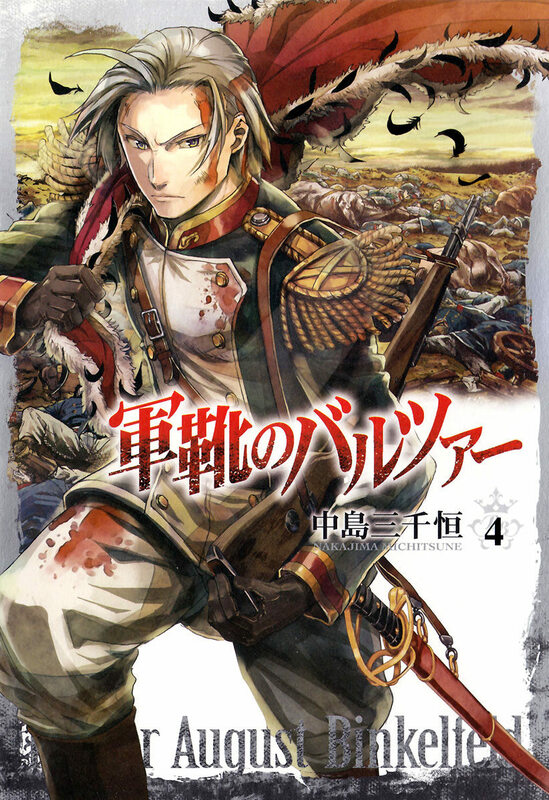 Overall, one becomes impressed with Baltzar’s sense of justice, personal ambition, and strong patriotism even as he sincerely tries to help the second prince–in ways that benefit Weißen too. Some people might find him using tragedies to his advantage and manipulation of people despicable, but he possesses great courage, being not at all afraid to risk his personal safety. He is also a very loyal toward his students and believes in them. No other male character since Sesshomaru has struck me as being so dynamic and multifaceted. He does remind one a little of Lelouch; yet, the fact that he’s less sneaky and more loyal to his comrades means that people who disliked Lelouch will probably be quite taken with Baltzar. 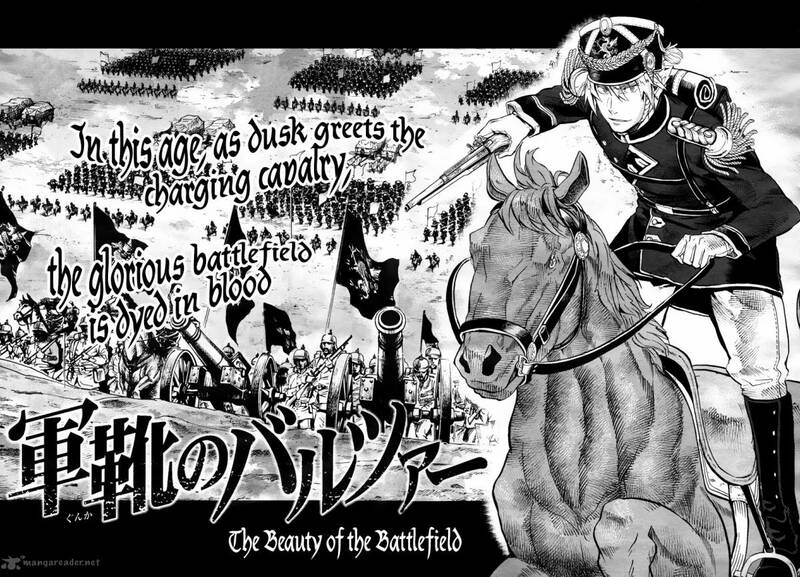 The students of the military academy tend to be quite interesting themselves. The most interesting of whom happens to be the sharpshooter, Marcel Janssen. 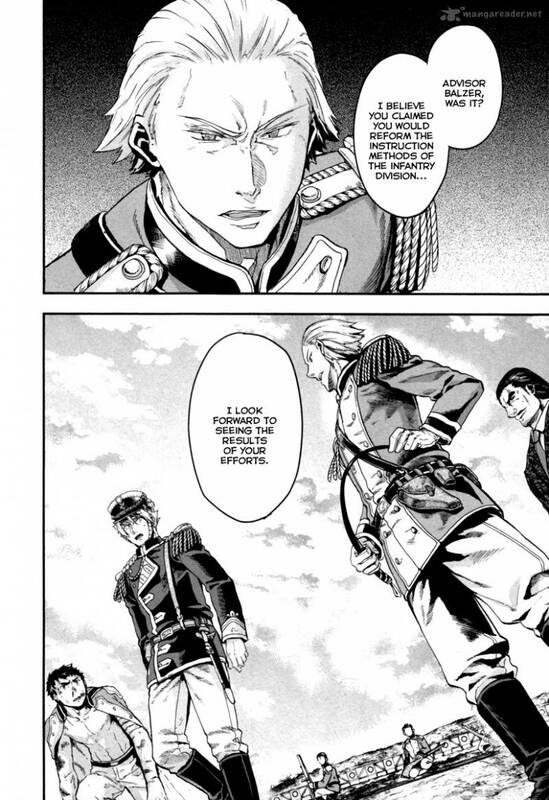 This was the cadet being whipped when Baltzar insulted the second prince for his barbarity. This kid has some real guts, and the occasions where he shows his courage happen to be some of the highest points in the manga. The people of Baselland’s resistance to militarism and industrialism makes for many of the conflicts in the story. They nearly riot when Baltzar demands that artillery cadets actually fire cannons for practice! All civic disturbance in the country come from opposition to these two movements, and, in a rather twisted fashion, the military academy must deal with them rather than the regular army. Their main enemy happens to be a group of terrorists supported by the aforementioned criminal mastermind having the king’s ear. 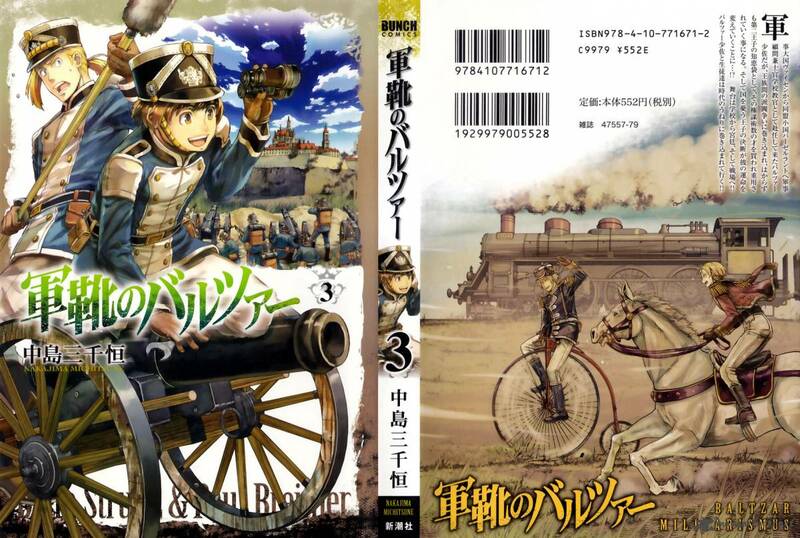 Anyway, Gunka no Baltzar‘s first 17 chapters proved to be true page turners, and I hope that it rapidly gains in popularity. This entry was posted in Anime and tagged 19th century, action, Adventure, Alexandre Dumas, anime, austro hungarian empire, Bakumatsu period, barbaric practices, Baselland, Bernd Baltzar, criminal mastermind, dynamic characters, Ezreich Empire, Gunka no Baltzar, industrialism, manga, Michitsune Nakajima, militarism, military, Weissen. Yeah, I loved Le Chevalier D’Eon and how they took that part of history to make a supernatural tale of intrigue. It felt a little like Alexandre Dumas’ works. I’m happy to hear that you’ll give Gunka no Baltzar a try. It’s a very unique story, especially when placed alongside the usual shonen fare.